Front of the Planescape DM screen that came with the campaign box set. Taken with my iPhone using effects from Snapseed app. Box sets from Advanced Dungeons and Dragons was way before my time, and it was only through research on the web did I find out about these treasure boxes filled with books, maps, characters, and other tools that would help GMs and players realize a fully developed world. 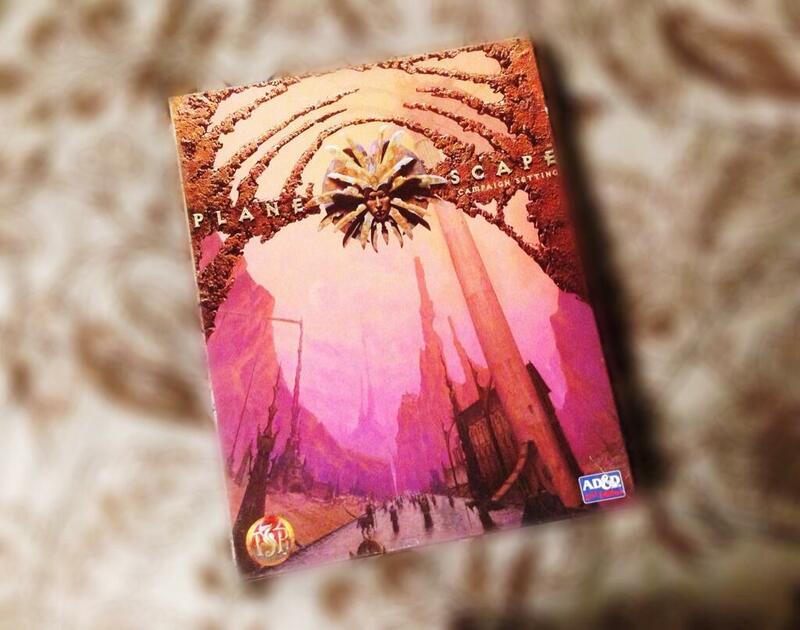 I came across the Planescape Campaign Box Set during my research for ideas for my upcoming Numenera Adventure Campaign, and saw numerous articles and forum posts about how great the setting is. Planescape was an AD&D campaign setting where players would traverse different worlds or other “planes of existence.” It uses the same character concepts with humans, elves and dwarves like Dungeons and Dragons, but instead of having the adventures/stories based in one world, there are numerous worlds the players can explore with Sigil being the city crossroad where players would start. An essential component of the campaign are the numerous factions who have different belief systems which can sometimes lead to all out war. I’m about halfway through all the material in the Planescape Campaign Box Setting and I’m already planning to get more of the box sets and books. It’s a really great setting and one I wish I had known about before and it’s only enhanced by the artwork by Tony DiTerlizzi. 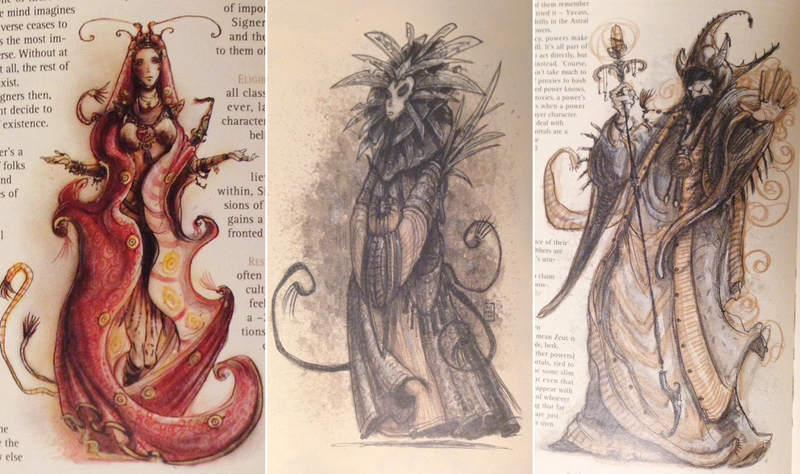 DiTerlizzi’s work is amazing and really helps set the tone for the world. Some of Tony DiTerlizzi artwork from the Planescape Campaign Box Set. The Planescape Campaign Box comes with a player’s guide, DM guide, a monster supplement book, a book about the Sigil and the Outlands, a DM screen and four color maps! I was able to find an online store that had the box and all the material in near mint condition, so it was practically almost like new. And it wasn’t that hard to track down. My thought as I was leafing through all this material was I wish they still made sets like these. But all hope is not lost. I’m planning to track down more classic AD&D box sets specifically Planescape and perhaps Spelljammer, another setting that wasn’t as well received as Planescape from what I’ve read, but has some interesting ideas and concepts. 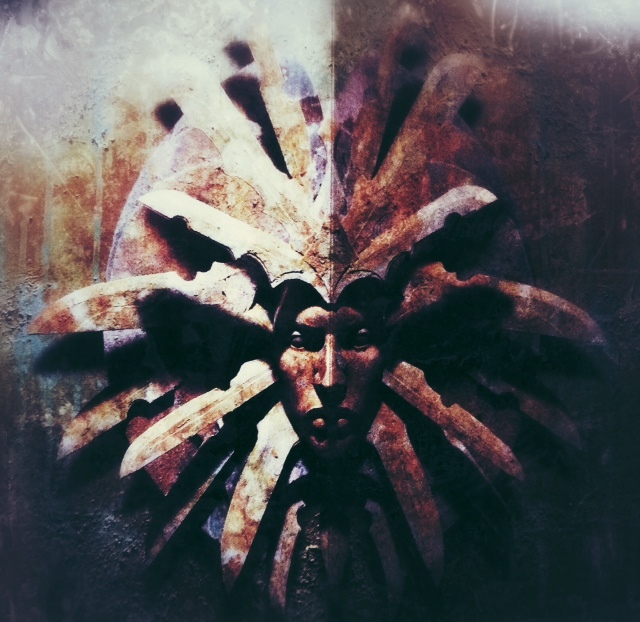 My initial intention in tracking down Planescape was to get inspiration and ideas for my Numenera game, which I fully intend to do, but I find myself interested in these fantastic settings and might have to do something more than just scavenge an idea or two from these worlds. 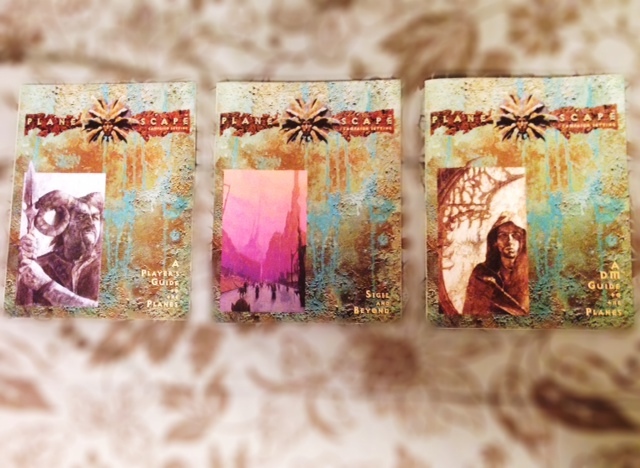 Player’s guide, city guide, and DM guide from the Planescape Campaign Setting Box. 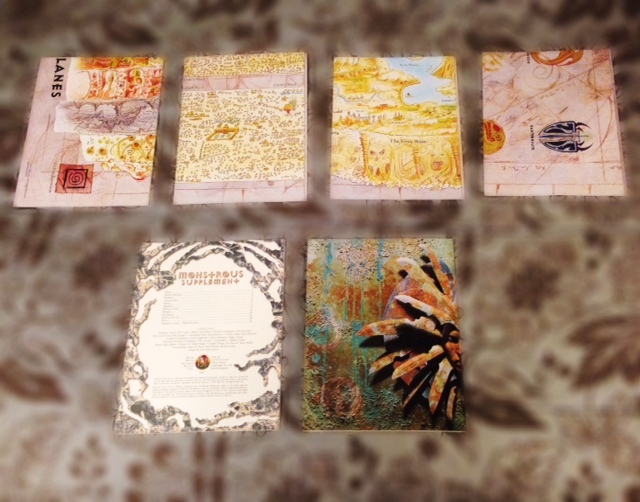 Four maps, Monster guide book and DM screen from the Planescape Campaign Setting Box. for old lucky ones like me, who were here during the promoting of these games, it’s all a story! Planescape is surely the greatest of the old TSR campaign, the most played at my table, and one of the setting more well known by many players. You talk about inspiration for Numenera, try Everway or Eclipse phase! I may attempt to GM a Planescape game at some point, it’s a very unique and interesting setting. There’s so many possibilities with that setting that’s it inspired some of my ideas for Numenera adventure campaign. I haven’t heard of Everway and Eclipse Phase, but I managed to find the Eclipse Phase web site which has got some great information and art on the setting. Everway was a no-dice game, with tarot and based on pictures inspiring the players. It’s a nice game of the 90’s where Spherewalkers travel between worlds for quests, they’re powerful people, so, it’s not really a bashing monster game. In the same way, here in France we have Reve de dragon (for you, Ourorboros the dream), it’s about travel between breach in the dreams of dragons (who are the creators of universe), it’s another “peaceful” game, where exploring and meeting peope is far more important than combat and loot. Reve de Dragon looks pretty interesting, I especially like the bit about the dragons dreaming their world. I’m finding a lot of good ideas looking at indie games and games made in other countries. The “peaceful game” is something I’m trying to attempt with Numenera. I would love to have a game just solely based on exploration, where combat is secondary. I’m working on another Numenera campaign that is getting close to that idea.